220V Appliances: What are They, and Why Do I Need One? 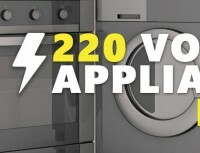 What is a 220v appliance, and why do I need one? In most countries outside of the United States, the standard voltage for appliances is 220v. This means that most US appliances will not work when plugged into foreign sockets, which can present a lot of problems when moving overseas or staying overseas for extended periods. You will often see people using transformers to help control the energy flow and allow US appliances to work in foreign countries. The type of transformer that someone moving from the US abroad would most likely use is called a step-down transformer. These can be a useful tool for short-term visits- but if your intention is to either reside in the country permanently, or travel for an extended period- using these types of transformers is not recommended. The best way to avoid these complications is to purchase appliances which are already rated for 220v. Aris moving has a vast inventory of 220v appliances which we will pack and ship for you to your destination. Whether youre moving, planning an extended stay, or simply want to protect your appliances over-seas , Aris moving can help you find exactly what you need at an incredible price.